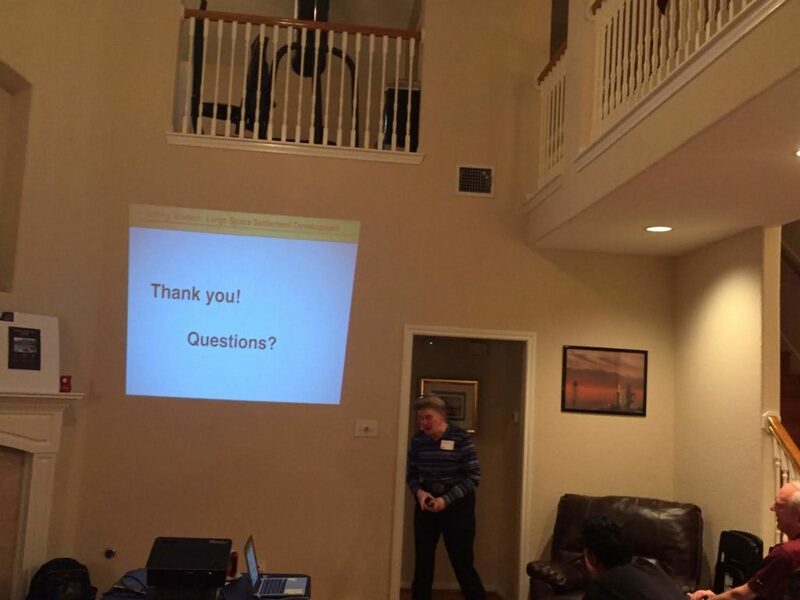 At our February 2019 meeting, we had about 30 people attend. Anita Gale was our guest speaker. She spoke about space infrastructure and how the ideas that had been part of the “future history” of the Space Settlement Design Contest are now becoming reality. It is an Ecosphere, a completely self contained ecosystem. It has algae that absorb carbon dioxide, produce oxygen and food. The miniature shrimp use the oxygen and eat the algae. It is a materially closed world. These ecospheres usually last for 2 years without problems, but some have been lasted as long as 20 years. The earth is like the ecosphere. It is small compared to the rest of the universe and it is materially closed (mostly). The significance of this gift is that Anita is helping humanity break free of our materially closed world and to start using the resources of the solar system. We also had Mallesh Maharana attend the meeting. He is the winner of the 2018 Space Vacation contest. And he has won a ZERO-G Experience. Here Nathan explains the program and Mallesh discusses his entry. 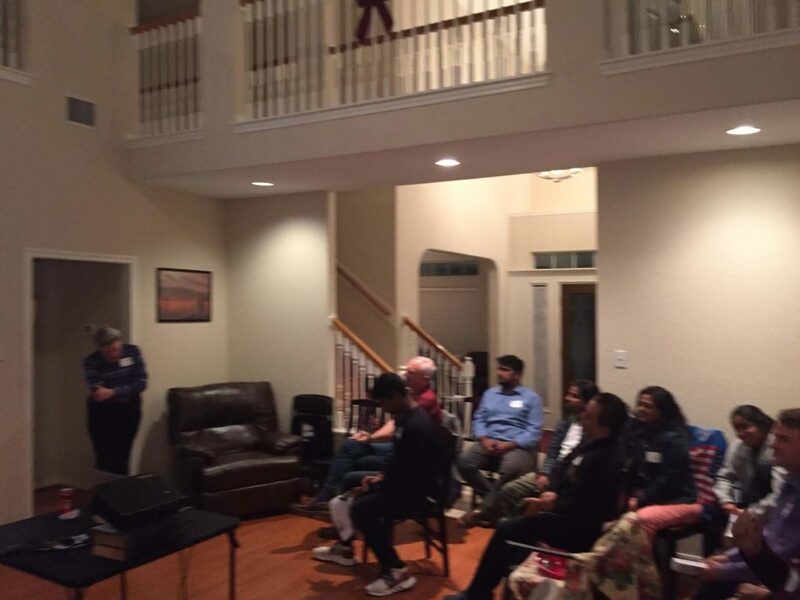 It was a great meeting, and I look forward to seeing you at the March 2, 2019 meeting. 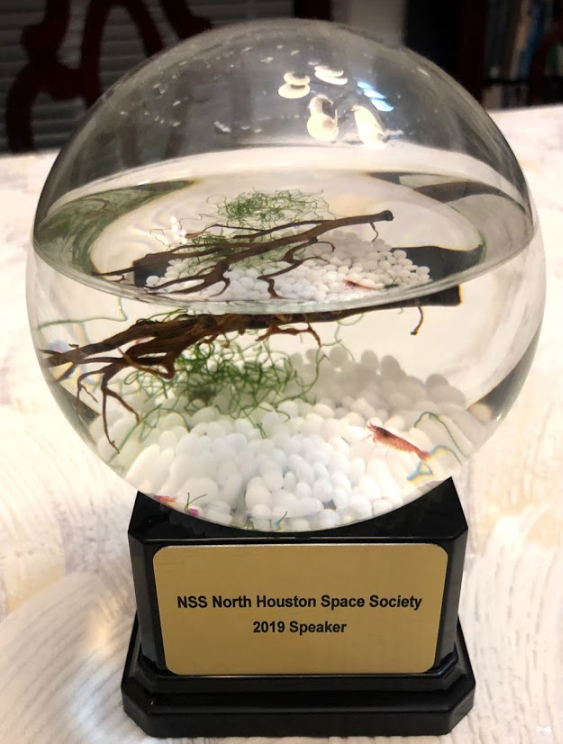 “Who can own the moon?” “What happens if a rocket from another country damages your property?” “Can you salvage an abandoned satellite?” We had an opportunity to talk about these and other questions with Nathan Johnson, a space law attorney licensed in Washington, DC at our November 2018 NSS North Houston Space Society meeting. Mr. Johnson now has a space law podcast to talk about these and other topics at http://AstroEsq.com It comes out every two weeks, and I have learned a lot from listening to it. Mr. Johnson has worked in the emerging commercial space industry. He worked at the FAA Office of Commercial Space Transportation during SpaceX’s first berth with the International Space Station, on Capitol Hill during deliberation over regulating commercial human spaceflight and has consulted for private companies and investors in evaluating new and novel business opportunities in orbit, lunar, and deep space. He also volunteers as the Executive Director of the new Texas Space Foundation, a 501(c)(3) non-profit advocacy group which works to increase awareness, activities, and action on behalf of the regional Texas space economy. Posted on February 13, 2019 February 13, 2019 Leave a comment on Questions about Space Law? Returning to the moon has become a topic of renewed interest in the last year or so in the United States. It has also been of great interest in many other countries for the last several years. What has changed recently and why is there so much interest now? What resources are likely to be found on the moon and what will it take to utilize them? Establishing a lunar capability for In-Situ Resource Utilization (ISRU) and manufacturing to create infrastructures that support permanent human expansion beyond the Earth’s surface, while ensuring human survival and quality of life on the Earth, will inherently be a complex and risky venture. What are the technological, economic, legal, and policy challenges to be overcome? What are the expected benefits? How might this be able to work? David Cheuvront is an independent business and technology advisor, mentor, and consultant with over 40 years of experience in aviation and space, with half of that as a NASA engineer at the Johnson Space Center. He actively supports commercial space initiatives, start-ups, STEM education, and collaborations across diverse disciplines and organizations. He initiated and co-led a NASA Ames economic research project on space development to identify conditions under which lunar mining and propellant production could become investable. Dave previously consulted to the “Evolvable Lunar Architecture” Study by NextGen Space LLC which resulted in the current U.S. Government’s interest in Public Private Partnerships for lunar development. Dave is a member of the NSS Policy Committee.